We had been wondering about it for months, here comes the price of the first plug-in hybrid car. 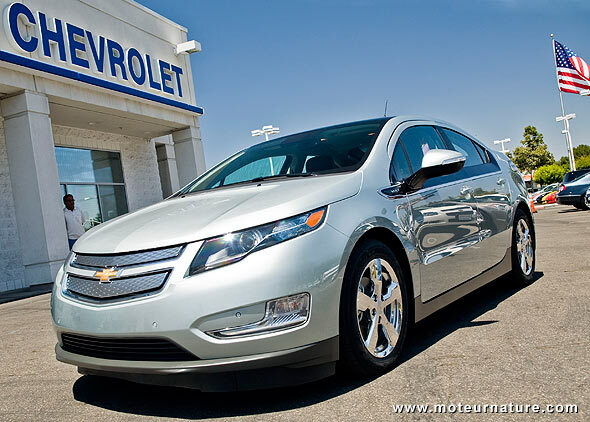 It’s American, let’s introduce the $41,000 Chevrolet Volt. We had a secret hope that it would cost less than $40K, but as the first plug-in hybrid ever, we guess GM was free to fix the price at whatever level it wanted, and we certainly don’t think it’s too expensive. The Honda Insight starts at $20,550. With a 40-mile range in electric mode, we don’t hesitate saying the Volt’s twice better. And a better deal may be to lease the car. Chevrolet only asks for $2,500 down, with $350 per month, for 3-years. That sounds enticing. More worrying is the fact that the Volt will only be available in 6-states: California, Connecticut, Michigan, New York, New Jersey, Texas, and Washington D.C.
Those living in another place like myself will have to wait at least till the second half of 2011 to get a Volt. I hope Chevrolet will be able to increase production volumes rapidly. The lease offer is truly great, there should be thousands of people signing up.